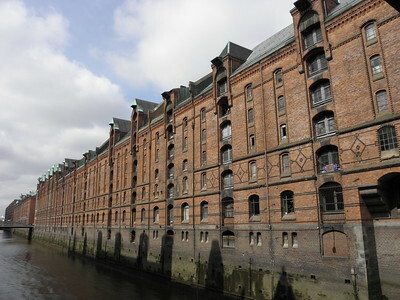 The Speicherstadt and Kontorhaus District with Chilehaus are two commercial quarters with offices and warehouses close to the port of Hamburg. They date from the late 19th and early 20th centuries. The iconic Chilehaus is a ten-story office building. It is an exceptional example of the 1920s Modernist architecture (Brick Expressionism style). These groups of buildings in the harbour area of Hamburg are probably the most promising entry on the current German tentative list. The sites are easy to access in the south of the city, both by car and public transport. I started my visit at the Chilehaus, a marvelous structure that lies at the heart of the Kontorhaus District. It’s a 10-storey building that is shaped to fit an irregular area between two streets. Just a touch of Chicago or New York, transferred to northern Europe. 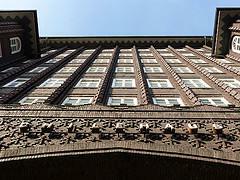 The other early 20th century office buildings in the Kontorhaus District, such as the Sprinkenhof, are not bad either. They have really massive fronts, and are made out of brick. Speicherstadt, the other part of this TWHS, lies about 1km away. This is the former warehouse district, “the world's largest remaining warehouse complex from the late 19th and early 20th century”. I can’t think of a similar WHS, except for Liverpool which has a very different feel and architectural style though. Goods like cacao, tea and coffee were stored and handled here in Speicherstadt. All buildings are 7 or 8 storeys high, and the warehouses were fitted with lifting gear on the outside. This is still visible. Since the 1980s the area has lost its original use, and the warehouses were taken over by no less than 220 carpet shops (run by Iranians). This is still the most prominent use now, although the carpet trade seems to have slowed down also. The small Speicherstadt museum has more displays than original objects, but tells the background stories on the area’s history well. A lot of the buildings in Speicherstadt were destroyed in WWII – so part of what you see nowadays are reconstructions. It’s a pleasant area to walk in, and stuffed with restaurants, bars and tourist attractions like a musical theatre. On the occasion of World Heritage Day 2017 I decided to visit my home town’s world heritage site: the Speicherstadt and the Kontorhausviertel. Leaving my office at Gänsemarkt I crossed Jungfernstieg and the Rathausplatz and headed for the Chilehaus. From there I went on into the Speicherstadt and ended up at Landungsbrücken. Had the weather been better I would have hopped onto a harbour ferry to Övelgönne. To me this is a great walk and comes highly recommended if you are ever in the area. 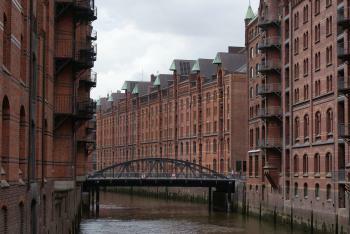 Both the Speicherstadt and the Kontorhausviertel signify a major change in urban planning for Hamburg. The island the Speicherstadt was built on used to be a residential area for poor families working in the harbour. All of them were evicted from the inner city to make room for progress. If you want to see how it looked like before, there is a tiny row of houses near the Michel (Krämergasse) that should give you a bit of an impression. The Kontorhausviertel buildings, too, are pure office building separating work from living. The development continued over the decades and nowadays the inner city of Hamburg is mostly devoid of people at night, a bit frightening if you ask me. As such I am not sure the change these buildings heralded was a change for the better. Indeed, if you are in the Speicherstadt you can cross into the neighboring Hafencity and see how city planning has changed. The Hafencity houses both apartments and offices, combining working and living. Historically, the area the Hafencity was constructed on was also part of the Speicherstadt, but this part was destroyed during the war. Ironically, the Hafencity itself is rather sterile. Turns out that if you only create luxury appartments for well to do singles and couples without kids who use the appartment as an investment or for the occasional visit to city, the neighborhood isn’t all that lively. The classic way to see the Speicherstadt is the harbour cruise. There are multiple operators offering these. All tours depart from Landungsbrücken and will also take you into the modern port. It may be very touristy, but it’s mandatory if you come to Hamburg for the first time. When you go for a boat, try to get a peek of the boat first. Does it offer nice views? Is it already very crowded? ... Prices, I believe are more or less the same. The Speicherstadt also boasts a plethora of museums in the old warehouses. The most popular one (and actually the most popular site in Hamburg) is the Miniatur Wunderland. Some nerds set their mind to building toy train landscapes for a living. And miraculously they didn’t go broke after a few months, but struck a nerve. Nowadays you can even explore the site via google street view. Or you have your company throw their Christmas party on site. Have to admit that I skipped on the toy trains and focussed on the drinks. There is also a spice museum, a customs museum, the Speicherstadt Museum and many more. You also find plenty of opportunities to buy a Persian carpet as the Speicherstadt is one of the largest global trading hubs for these outside Iran. To me though wandering around the Speicherstadt is pleasure enough. If you like a guided tour you can book these at the Speicherstadt Museum. The Chilehaus as well as the other buildings of the Brinkenhof Viertel are up to this day used as office buildings. It follows that visits are restricted. But you can peek into the staircase of the Chilehaus which is already quite nice. Alternatively, you can do an internship at an insurance company having their offices there. The views I had from up top were spectacular. Hamburg is a transport hub for Northern Germany allowing you to see plenty of world heritage sites as a day trip. To see the Wadden Sea my recommendation would be to jump on an early train to Sylt. The Wadden Sea is on the eastern shore of the island. A Südspitzenwanderung around Hörnum in the South will give you a nice impression. Also try to spend some time in Keitum, the most traditional village in Sylt. If you walk into the Ralph Lauren store you will be in my great grandfathers Friesenhof. If you want to stay in Hamburg while you visit the Wadden Sea you have to travel to Cuxhaven from where you can walk over to Neuwerk, a small island that for historical reasons is part of the state of Hamburg. Be advised you have to align this with the timings of the tides and of the ferry for the way back. Lübeck and Wismar can be combined into a single day trip. Wismar to me is the prettier city, Lübeck the more important one in historical context. Bremen is a one hour train ride and easy to do, too. Note that you may have to reserve in advance to get into the town hall. Christianfeld is also within reach if you have your own car or plan well and get up early to catch the train to Padborg. Several other hotspots are nearby. Berlin can be done in a day trip by train, but it will be hard to do all three sites in a single day. The same applies to the sites in the Harz. There are also some tentative sites of note. Hamburg itself has the Jewish cemetery (see my review). Check the opening hours before making plans (mostly open for a few hours on the weekend). Northern Schleswig Holstein bodes Haithabu, a Viking trading town. And Mecklenburg Vorpommern has the Schwerin Residence. Not going to write a guide book here, but... Spend some time on the Elbe and watch the big boats in the port. Walk along the Alster and Jungfernstieg. Enjoy what used to be the 2nd largest city of Denmark in Altona. Take a stroll along the Reeperbahn at night. And at day time for the contrast... And ping me if you need a guide. It will be my pleasure. If I happen to be in. It looks like I am the first reviewer to have visit this site since it was inscribed and I can report that I didn't spy a UNESCO logo or information board anywhere (though that doesn't mean there isn't one). I spent a night in Hamburg in January 2017 and stayed in a waterfront hotel in the inscribed area. The warehouses, which display a definite coherence of style, stand testament to the development of large-scale international trade in the wake of the Industrial Revolution. My overall impression was of a pleasant enough place but not a terribly exciting World Heritage Site compared with others. Of the 105 I have so far visited it is most similar to Liverpool. Both parts of the nomination, the Speicherstadt and the Kontorhausviertel, are easily covered by foot and can be visited in a short few hours. 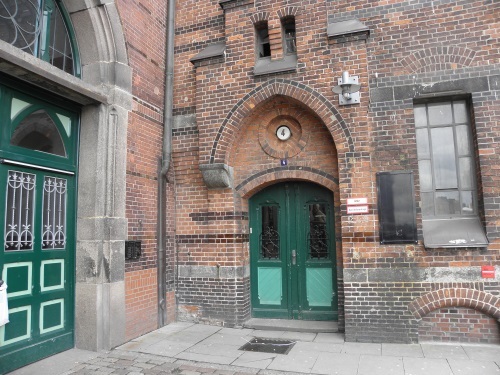 I started my tour with the two most emblematic buildings of the Kontrohausviertel: Chilehaus, which used to be an independent candidate for a WHS, and the neighbouring Sprinkerhof. In fact, the entire district is small and can easily be covered. In fact, it is difficult to spend a lot of time at the Kontorhausviertel because it still fills its original function as a business district. All buildings are occupied by offices and unfortunately you cannot get into most of the buildings. I did manage to get into the Chilehaus to discover a doorway reminiscent of the Bauhaus architecture. It greatly reminded me of the Bauhaus University in Weimar. All buildings in the district are made of the typical red bricks and many are covered with traditional marine motives. 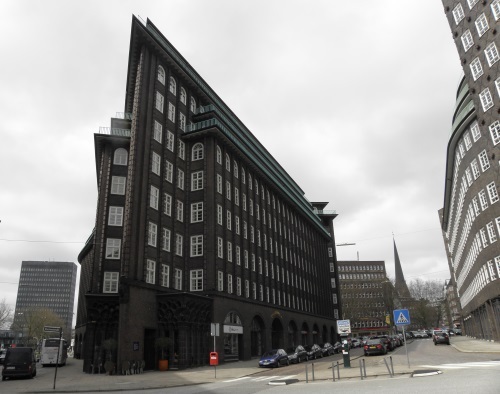 Both of these trait link the modern architecture to Hamburg's past. Despite being modern for their time and architecturally impressive I did not find the buildings very appealing. The nearby Speicherstadt was largely destroyed in WWII so most of what we can visit now is a post-war reconstruction. You can read about it in a trail with explanatory plaques going through the complex. Only the central blocks were reconstructed apart from the oldest one which is outside the core zone and now houses the Maritime Museum. Similar to the Kontorhausviertel, the Speicherstadt preserved its original function, albeit to a lesser extent. It still serves as the largest concentration of oriental carpets in the world. It was funny to see the names though: Armenian, Persian, Turkish, but no Germans at all. Interesting architectural aspects were again the incorporation of maritime motives and the attempt to emulate aspects of the traditional Hanseatic architecture. This was done on a very abstract level, as the Speicherstadt does not stylistically resemble the old houses you can see at nearby Deichsstraße. A little peculiarity was the inclusion of Christian elements such as Maria icons on the warehouses. I guess their function was purely ornamental since making the secular buildings church-like suited the historicist idealism. In general I found the WHS interesting, although it is certainly not my favourite in Germany. I have visited Hamburg several times and a stroll through the Speicherstadt and the Kontorhaus district was always a must. The Chilehaus is an iconic building of Brick Expressionism, an architectural style particularly prevalent in the north of Germany and in the Ruhr area. The view from the east to the sharp tip and the curved façade along the Pumpen street are amazing. Despite the size, it is an elegant building, reminiscent of a palace. 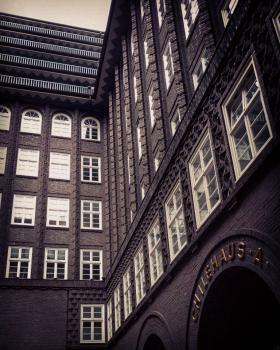 The Chilehaus is still used as an office building, so best to visit on a weekday when the staircases are accessible. Stairs, floors and other interior details have been preserved in the style of the 1920s. But until now there are no guided tours. The other houses of the Kontorhaus district (Kontorhaus is an old German word for office building) are less spectacular but still worth seeing, the proposed area includes also the Sprinkenhof, Mohlenhof and Messberghof buildings. Just a stone's throw away is the Speicherstadt (photo), older than the Chilehaus and different in style, but no less outstanding. The warehouses are also built of brick, it's fun to explore the details of the façades, the small towers and gables with winches. Originally the warehouses were built for the trading of coffee, tea and spices, today they are mainly used by carpet traders, but there are also museums and other tourist attractions. You can get an impression of the interior when visiting the Speicherstadt Museum or the Spice Museum. After dark the Speicherstadt gets a very special atmosphere, when the steel bridges and the red brick façades are beautifully illuminated and reflect in the water. A harbour cruise is a good choice, but whether the boat ride goes also through the narrow channels of the Speicherstadt depends on the tide, so it is better to ask beforehand. The site is a candidate for inscription in 2015 and in my opinion the chances are good that Hamburg gets its first cultural WHS. I visited these sites in Hamburg in October 2014. They are truly unique and in my humble opinion deserve inscription as they truly possess OUV. The best way to visit the Speicherstadt is by going on a harbour cruise. The red brick wharfs and metal winches of the Speicherstadt are HUGE and are just a pleasant stroll away from the Chilehaus. The Chilehaus is a true architectural gem and just opposite is a modern glass/metal replica building. It really is reminiscent of New York not Europe! Nearby is the Chocoversum, a chocolate house and museum worth visiting not only for the information provided! Dubbed as another WHS: "Little Venice", "Venice of warehouses", "Hamburg's Venice", "Northern Venice"